Have you ever wondered what all those warning signs on vechicle's and storage containers mean? Well, look no further. IDR's Hazardous Waste Warning Placard Sign is FREE SIGN you can download and print out. The sign is 24" x 36" and is print ready. Simply download the sign, send it to the printer and you'll have a fantastic sign to place in your office, warehouse or classroom. 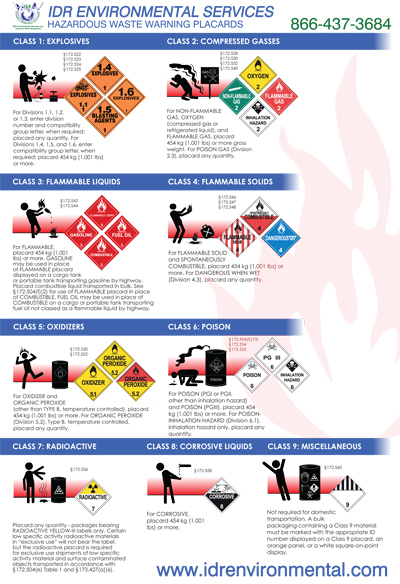 The sign is designed to show you which placards belong in what Class category and some specific information on certain classes of hazardous waste within that category. If your company is involved in placing the correct hazardous waste placard signs on your vehicle or storage container, then this sign will come in really handy. With this sign we decided to have a little fun with it. Our business can get real dry very quickly, so we added a little fun and a little education together to form a sign we hope you will enjoy. The file is a pdf format so you don't need to do anything to it. Simply download the file and send that file to your printer.